Peapod, online at peapod.com, is an online grocery delivery source. To make things easy for their customers Peapod allows you to enter you zipcode and find if their services are delivered to your area. On Peapod browse the aisles just like you would at any normal grocery store. Find any baking and cooking products, produce, meat, deli products, frozen foods, and even health and beauty products at Peapod. 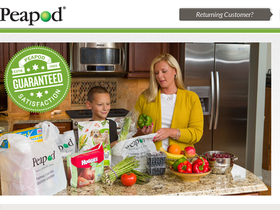 So check if Peapod is available in your area to have grocery shopping made easy. Be sure to stop by RetailSteal for the best Peapod coupon codes, Peapod promotions, and Peapod discounts. Delivery rates for you Peapod order vary depending on the location and total order. See website for full details, exclusions may apply. Enter this coupon code at checkout on Peapod to receive $20 savings on your order of $75 or more. Save $25 on each of your first 2 orders + free delivery for 60 days with this code from Peapod. Use this coupon code on Peapod to receive $15 off your first order of $60 or more. Only valid for new customers! Use this code on your first business order from Peapod to save $50 off your order of $150+. Enjoy free delivery for the first 60 days after you make your first purchase on Peapod. Shop the Weekly Specials at Peapod to receive savings on your weekly grocery products. Use this coupon code at Peapod.com and save $5 when you spend $60 or more. Shop at Wise Food Storage and enjoy free shipping on any order. Click here for code. Shop at Wise Food Storage and enjoy $265 savings on the Deluxe Package. Click here to shop.